Ernie Menehune sat in the Kon Tiki Restaurant & Lounge on East Broadway a couple of months ago and proposed a wacky idea to general manager Lou Lazos. That was a Sunday afternoon, and the following day, Menehune, a retired Hawaiian singer and performer who once was a regular on the Vegas Strip and Lake Tahoe, called the popular Tucson Polynesian-themed restaurant and club. His doctor nixed the plans, he told Lazos. “He said, ‘Lou, I hope you’re not mad,’” Lazos recalled last Friday, the day after Menehune died. He was 92. 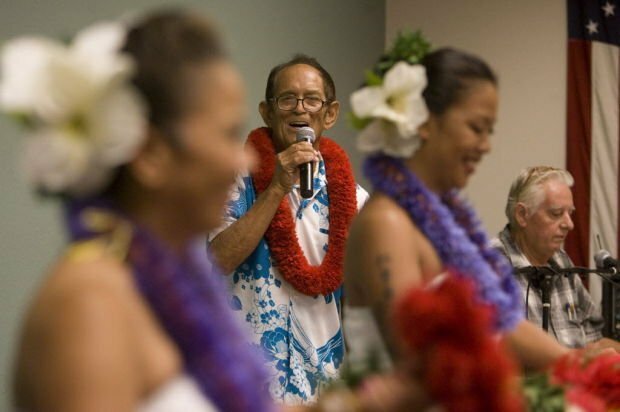 His death came a week after being diagnosed on March 19 with cancer, said his eldest daughter, Eraina Kennett, who, along with a sister and a sister-in-law, were with Menehune when he died Thursday morning. Menehune was born on Jan. 26, 1923, in Waimea, Hawaii, where he spent his childhood. He worked a handful of jobs, including as a bus driver, horse jockey, laborer in the sugar-cane industry and plumbing, alongside his father before moving to Arizona in the early 1960s. He settled in the Scottsdale area and returned to plumbing to support himself while he pursued a music career. He joined several Polynesian bands in the Phoenix Valley before embarking on his own as a headliner on the regional supper-club circuit and at clubs in Vegas, Reno and Lake Tahoe in Nevada. Menehune was introduced to Tucson through his weekly runs at the once-storied Spanish Trail club off Interstate 10. Menehune moved here full time in 1974, building his 5-acre Menehune Ranch just west of Tucson Mountain Park off Kinney Road. The ranch was a re-creation of the island paradise he left behind in Hawaii, his daughter said. It included a garden of cypress, palm and palo verde trees and a waterfall that fed a small lagoon. A few years ago, the parties stopped, but Menehune’s love of performing never wavered. In late 2012 — weeks before he turned 90 years old — he played a New Year’s Eve show at the Kon Tiki. Kennett said her father, who was inducted into the Tucson Music Hall of Fame in 2007, performed a show by himself at the Moose Lodge two weeks before he died. In addition to Kennett, Menehune is survived by six sons, Ernest M. Rivera and Ryan Menehune, both of Hawaii; Michael Carl of Idaho; Patrick Menehune and Ernie Menehune, both of Tucson; and Laszlo Layton of Mesa; and two daughters, Carol Ann Wick of Tucson and Gloria Jean Ballenger of Virginia Beach, Virginia. He was predeceased by his wife, Beverly Menehune, and a daughter, Margie Carlson. Kennett said services will be held at 5:30 p.m. April 7 (doors open at 4:15) at the Tucson Estates Multipurpose Hall, 5900 W. Western Way Circle. Contact Cathalena E. Burch at cburch@tucson.com or 573-4642.